The proposed Villas De Carmelo project is a subdivision to convert 10,350 square feet of an existing hospital structure into nine condo units and construct 37 additional condo units in the unincorporated County near Carmel off Highway 1. The project applicant is Rigoulette, LLC. The project would convert an existing hospital structure into nine condominium units and construct 37 additional units. 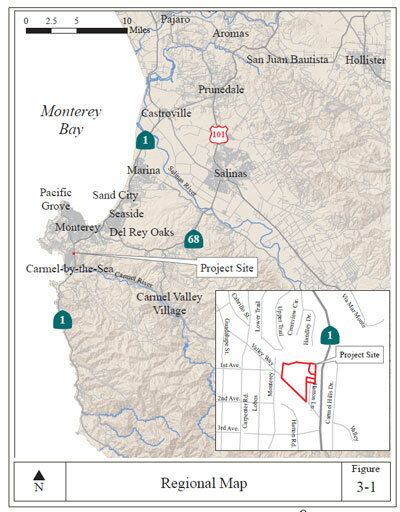 The project is governed by the policies of the 1982 Monterey County General Plan and is within the Carmel Area Land Use Plan. The Board of Supervisors unanimously denied the project in November 2011. Then the Planning Commission reversed its decision and recommend the Supervisors approve the project in August 2011. The Planning Commission recommended denial of the project in June 2011. The City of Carmel opposed the project. The County has planned to do a Mitigated Negative Declaration, but after public pressure decided to do a full Environmental Impact Report. This map shows the Villas de Carmelo project in relation to surrounding areas. 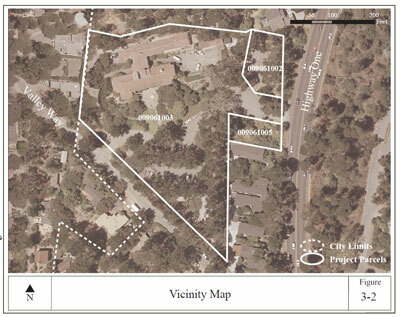 This map shows the Villas de Carmelo project with its parcel boundary outlined. The Regional Desalination Project is described as being approved and identified as replacing existing water supplies that are constrained by legal decisions. Additionally, the project has been delayed due to alleged conflict of interest allegations. Thus, assurance that the project will replace existing water supplies is lacking. Highway 1 and Carpenter Street intersection is already a Level of Service (LOS) C. With this development it would drop to a LOS D. The FEIR should be revised to find the project’s cumulative impact on traffic significant and unavoidable. Payment of the in-lieu proposed by the applicant does not address the shortage of affordable housing on the Peninsula while rehabilitating existing structures to include some affordable units would meet an unmet community need.